Been a lot of personal “behind-the-scenes” stuff going on at Branded this year, but I’m doing my best to bounce back and get to some more regular posting soon. In the meantime I wanted to tackle this week’s League assignment as it touches on the very subject I’ve been meaning to write about for the past couple months, comic books. Remember when I talked about the awesome gift, my original Atari 2600 game system and original eight games, a long time friend (D) gave me recently? Well, not only was he gracious enough to restore one huge chunk of my childhood, but he also returned another important part of my past that’s been MIA for over 18 years, my run of Uncanny X-Men comics that I traded him out of desperation in high school. At the end of my sophomore year of high school my Dad was laid off from his position as a salesmen for a large semiconductor and telecommunications company. I’ll be honest, he made some pretty decent dough back in the day and throughout all of my life to that point we lived very comfortably. 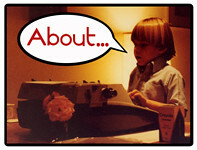 It wasn’t lavish by any means, but we weren’t hurting and there was always a decent allowance that I used to keep myself in toys and comics. When he lost his job though, we were in sort of a pretty tough situation as his company had moved my family across the country twice in the space of two years, so they had fronted my Father a large portion of the down payment on the house we’d been living in. After they laid him off they wanted that money back and it forced us to regroup as a family, cut costs as much as possible and move into a small two bedroom apartment. None of this really mattered to me, but I did lose the bucks that I needed to keep me in comics, so I started to cannibalize my collection, selling off whatever I could to get the money to buy new comics. As any collector knows, this can be very dangerous and usually leads to losing everything, which is basically what happened in my case. There were a few runs that I held off on, stuff that was really personal to me, books like The Uncanny X-Men, Wolverine, and X-Factor. As I started to chip away at the “money” books in these runs my friend “D” made me an offer on my collection of Uncanny X-Men books that I couldn’t refuse so I traded him my run, issues 196-281. At the time I was sort of relieved because those books were the cornerstone of my collection, the stuff that got me into the hobby, and by parting with them I felt the need to collect comics sort of die. It’s not that I wanted to stop collecting and reading, but it’s an expensive habit and at the time I kind of wanted to just take a break. 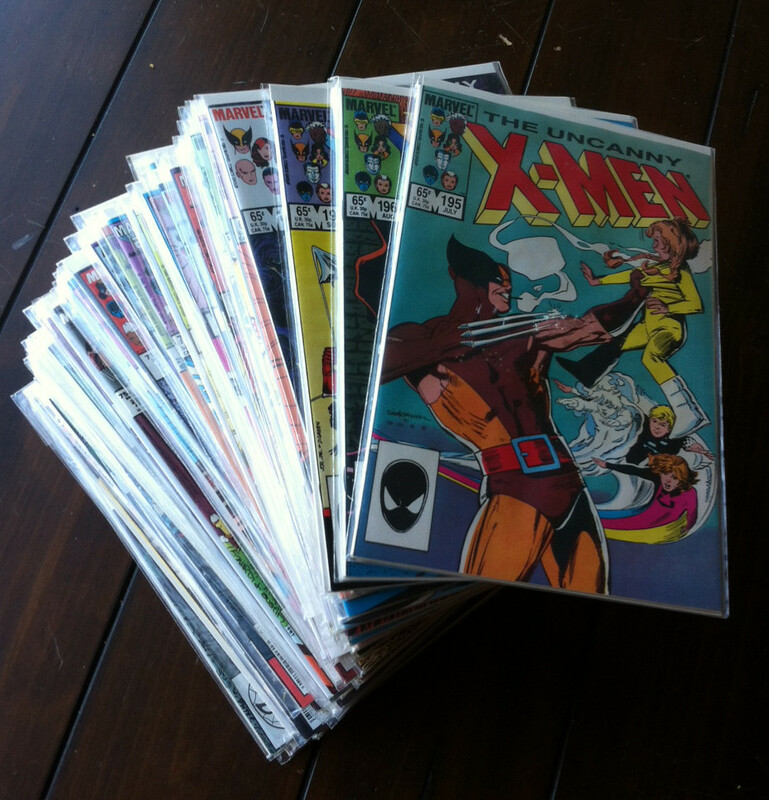 Well, over the years I’ve drifted back into collecting, though nowhere near as fiercely as I did during that time between 1988 and 1995, and big reason for this is that without those original X-Men comics I sort of feel disconnected from the hobby. 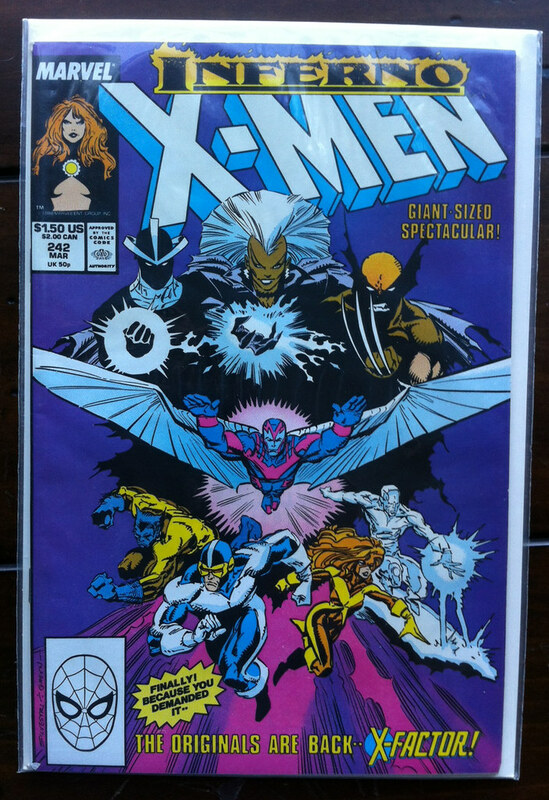 More importantly, sort of like Scrooge McDuck has his Number One Dime, the most important piece of currency in his fortune, I had my own lucky book, Uncanny X-Men issue 242. This was the first comic I bought back in 1988, and it’s always been the center of my collection. I’ve picked up copies of the book over the years, but not having the actual copy that I purchased from a grocery store spinner rack back in the day has always been a little pin prick of loss and remorse when it comes to my comic collecting. That all changed earlier in the year when “D” regifted those books to me along with my long lost Atari. There aren’t even words for how happy I was to reunite with this stuff. Again, I don’t have a ton of surviving stuff from my childhood and so this pile of comics is just beyond amazing. There was a time when I felt like the stories that Chris Claremont wrote in these issues defined me. Like a lot of kids I heavy related to the characters, Wolverine, Storm, Rogue, Longshot, Dazzler, Colossus, Psylocke, and Havok. These were “my X-men”. Later, I fell in love with Gambit, got acquainted with Polaris and Forge, was only mildly annoyed by Jubilee, and dreamed of what it would be like to step through the Siege Perilous. I did a quick tally to see what these books retailed for, not because I give a damn what they’re worth monetarily (they’re priceless artifacts as far as I’m concerned), but I was curious what my friend potentially gave up to reunite me with these books. Let’s just say that at market value was about a month’s rent, and I know that he knows that. Egads, can’t thank “D” enough. Like what you read here? 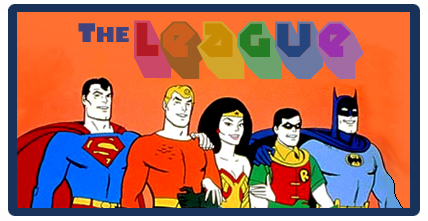 Why not visit some of the other League members to see what they had to say about this week’s comic books topic! PreviousCult Film club Stickers Now Available for Purchase! Michael Knight & the Mystery of K.I.T.T. and the Blue Prowler!